A recent UN investigation following an attack using an explosive device has revealed a snapshot of the types of small arms in use by insurgents active in Mali. Last week, MINUSMA released an image of items recovered from the house of two people who were arrested and handed to Malian authorities. In the foreground is a box of Russian F1 type hand grenades in superficially good condition, as well as various pieces of load-bearing equipment of relatively recent manufacture. However, an examination of the small arms in the background reveals these men to be somewhat ill-equipped and reliant upon legacy weapons. Only one AK pattern rifle is in evidence: a rather weary-looking Chinese Type 56 (chambered for 7.62 x 39 mm). Instead, SKS pattern carbines predominate. This Second World War-era Russian semi-automatic design (also chambered for the readily available 7.62 x 39 mm) has been produced by a number of other countries post-war, notably by China as the Type 56 (not to be confused with the AK variant of the same designation). Three of the four examples visible in the photograph may indeed be Type 56 rifles on the basis of their ‘spike’ bayonets. Two of the rifles are even more antiquated; a Mosin-Nagant M44 carbine (7.62 x 54 mm R) with its distinctive side-folding spike bayonet, and an unusual bolt-action Mauser variant (missing its bolt). This is a Portuguese Mauser-Vergueiro M904/M39 short rifle (chambered for 7.92 x 57 mm), originally part of a 1904 German (DWM) contract for weapons chambered for 6.5 x 58 mm. In 1939, these were shortened and calibre converted, making it possible to ‘feed’ surviving examples with the standardised 7.92 mm Mauser cartridge. This is not a well-known variant of the famous Mauser, and has presumably found its way to Mali from one of Portugal’s former colonial possessions in the region (Guinea-Bissau or Cape Verde). Also recovered was an equally vintage Soviet-era Degtyarev DP or DPM light machine gun (7.62 x 54 mm R) with its circular ‘pan’ magazine, and a potentially more capable belt-fed FN MAG 58 General Purpose Machine Gun (GPMG; chambered for 7.62 x 51 mm). Note that this example is unusable in its pictured state, as it is missing its buttstock. Of these types, only the AK, SKS, and MAG have been previously recorded in Malian insurgent hands. 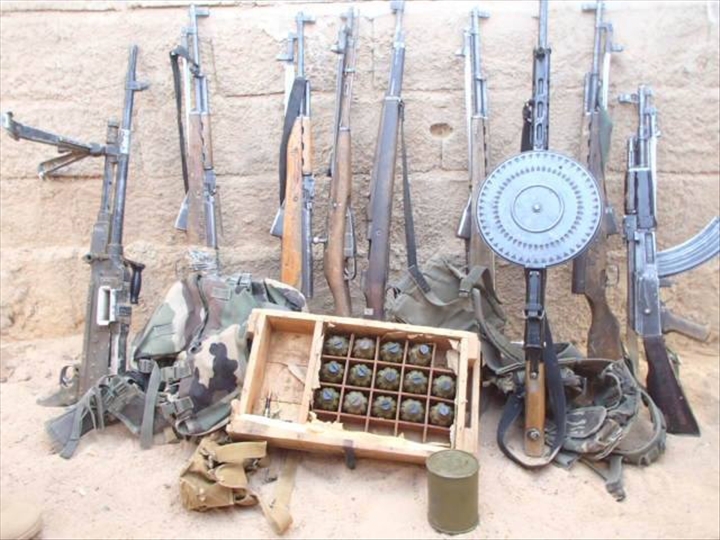 For other weapons in rebel use, see ‘Rebel Forces in Northern Mali: Documented weapons, ammunition and related materiel, April 2012-March 2013’, published by Conflict Armament Research/Small Arms Survey, London/Geneva, 2013. No matter how old any of these rifles are, it only takes one round from then hitting someone in the correct place to kill.